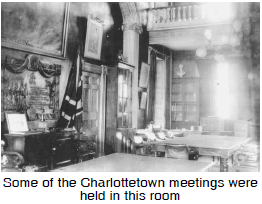 The Charlottetown Conference was originally planned as a meeting of the leaders of the three Maritime provinces, New Brunswick, Nova Scotia and Prince Edward Island. They wanted to discuss the possibility of a union among themselves, much like the union between the two Canadas. The leaders of Canada West and Canada East asked to attend the conference because they wanted to convince the Maritimers to join a larger union of all the British North American colonies. The meeting was set for September 1, 1864. The delegates from Canada arrived by ship from Quebec City with much fanfare. 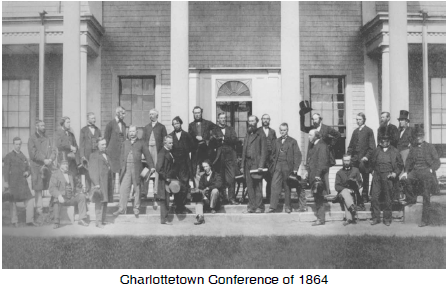 They all brought their wives and some champagne and for a week they worked on both the social interaction and political arguments that were required to bring the Maritimers around to the idea of Confederation. John A. Macdonald and George-Étienne Cartier presented the general terms of the Canadian proposal, Alexander Galt discussed financial matters and George Brown dealt with constitutional issues. The conference adjourned on September 7 with the Maritime delegates warm to the idea of a larger federal union. The delegates who favoured the idea saw it as an opportunity for improved commercial relations with the rest of Canada and a way to finance an intercolonial railway. Remember that most of the promoters of the idea of Confederation were friends or associates of the new industrialists who wanted these improvements in commerce and transportation. Another conference was set for October in Quebec City to discuss the details.